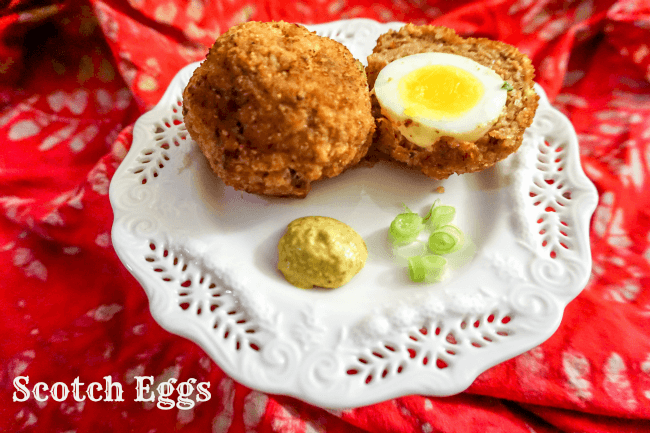 A Scotch Egg consists of a boiled egg wrapped in a sausage mixture and coated with breadcrumbs that is either baked or fried. Apparently, there isa lot of controversy of whether or not the egg should be hard boiled or soft boiled. 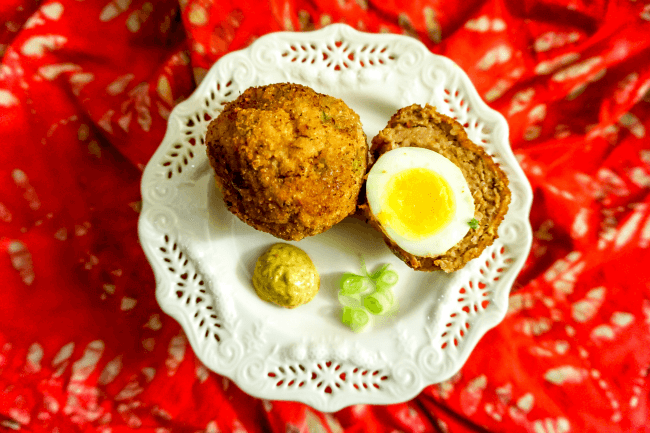 You can find lots of variations on the Scotch Eggs Recipe, but I think you’ll agree, mine is the best. The very first time I ever had a Scotch Egg was in a local bar when I went out to eat with my uncle. I was too young to drink, but the food there was amazing and I remember we ordered a couple Scotch Eggs as an appetizer. I’ll never forget how awesome they were and so growing up I spent a lot of time trying to replicate those eggs. 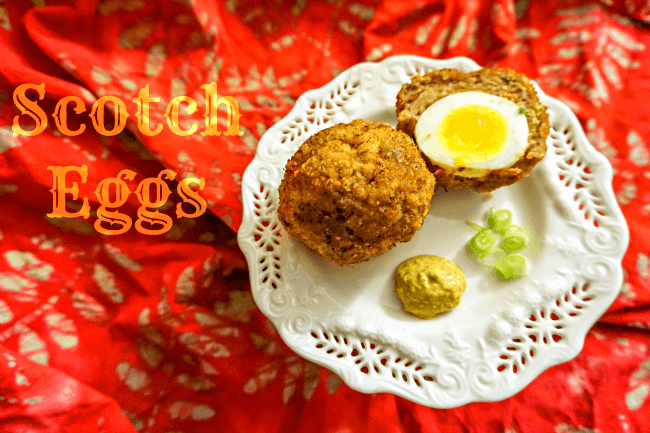 The bar is long since gone, but I prefected the Scotch Eggs Recipe. Boil 5 eggs on high for 7 minutes then immediately remove eggs to bowl with ice water to cool. In the meantime, chop scallions, garlic, and cripsy bacon and add to Italian sausage with mustard. Mix well. Make 5 oblong shaped patties. Heat oil to frying temperature. Beat remaining egg in small bowl. Put flour in small plate and breadcrumbs in another. When eggs are peeled roll them in flour then place one at a time into middle of patty and mold around egg until ball or egg shaped. Do this with remaining boiled eggs. Roll sausage balls in flour, dip in egg wash, then finally in breadcrumbs. Do this with remaining sausage balls. Fry until golden brown, usually 5 - 6 minutes. Remove and drain. Put into oven for 5 minutes. Courtesy of Live and Let Blog - All rights reserved. Do you have a favorite food that you recreated from a memory?